CADENAS PARTsolutions CEO and industry expert, Tim Thomas, builds upon the concepts covered in Parts Management 101 with an all new eBook: Parts Management 201. The goal is to help manufacturers and engineers re-use digital parts and streamline their design process, by taking a look at a modern standard parts management strategy versus a traditional classification initiative. In the following excerpt, Tim Thomas breaks down the problem with an example most anyone can relate to. “Why is it easier to find a document on Google than it is within your local library?” The library is perfectly organized, using the Dewey decimal system to neatly sort and classify each document, while Google has little organization, querying trillions of pieces of information for the right document. The ability to easily search and find information is the inspiration behind Standard Parts Management (SPM). SPM is to Google as Classification is to the Dewey Decimal system. SPM is a modern way to quickly and accurately find data in a “human” interface. Continue reading to find out how SPM stacks up against a traditional classification initiative. Learn how forward thinking companies are using parts search to foster reuse, reducing costs and design time. Parts Management 201 provides a deeper-dive into parts management for manufacturers looking to streamline their digital resources, with the ultimate goal of reducing design time and costs through part standardization, reuse and control. In this book we explore the benefits of two methodologies commonly used to enable rapid reuse of digital parts. 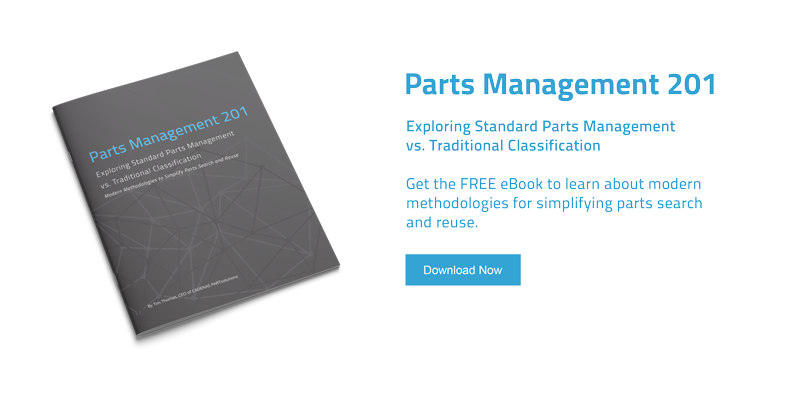 We review the technologically focused approach of Standard Parts Management (SPM), against the more traditional approach of manual classification of parts.